**Update 4:00PM -4/29/2015: Multiple new reports have surfaced now disputing the claims of the witnesses seen in photos, each of them working for the city paper. 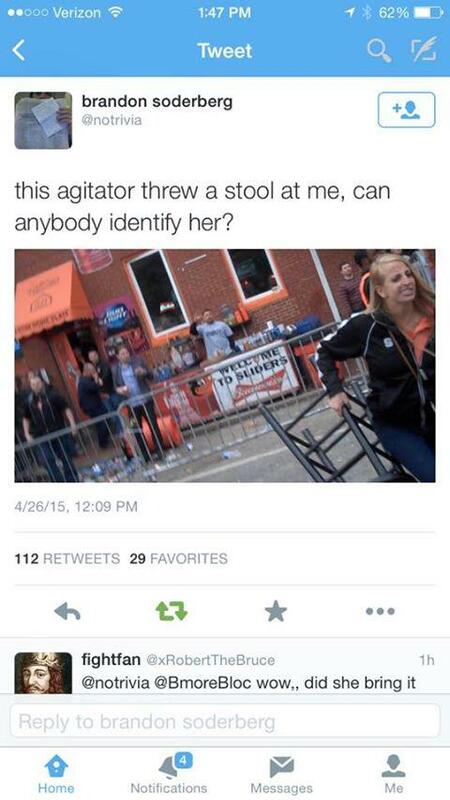 It has been confirmed that there were instigators on both sides of this dispute, and the actual content of these photos are still contentious. As people in Baltimore organize to defend their community against police brutality, there are many different stories coming out both through both the mainstream and social media describing what happened during this week’s Freddie Gray protests. There is now a heated debate surrounding various videos and photos that allege acts of violence, theft, and vandalism. However, it has now been confirmed that mainstream media sources have been posting pictures and creating their own stories to go along with them. In some cases, witnesses or people who were actually seen in these pictures have come forward to dispute the stories that have been ascribed to these images. Many of the photos that were taken of protesters interacting with sports fans were allegedly misconstrued by the mainstream media to portray only the protesters as violent, and the sports fans completely innocent. 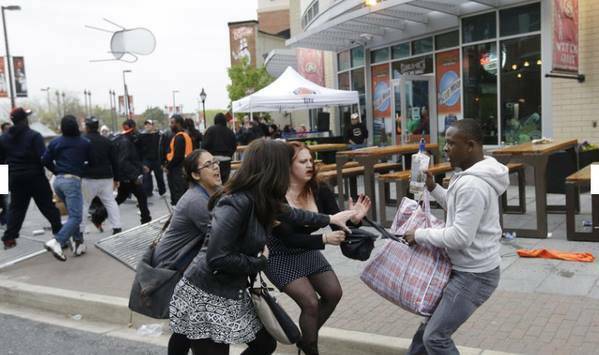 In one such photo, a group of women were lunging at a protester, and two other women were pulling her back. When the photo was made public, it was reported that the young man had stolen the woman’s bag and that the two other women were attempting to rush her to safety. However, hours after it went viral, one of the women in the photo came forward to dispute the story that had been subscribed to this image and share her side of the story. 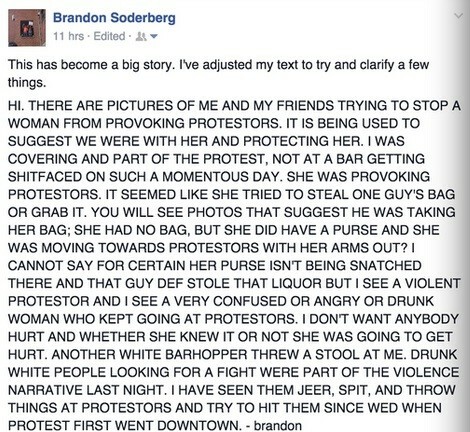 Brandon Soderberg of the Baltimore City Paper also witnessed sports fans instigating fights with protesters, and photos that surfaced of him were misrepresented in the media as well. He witnessed first-hand drunk sports fans shouting racial slurs and spitting at protesters, instigating fights with them as they marched by peacefully. In one photo, Soderberg can be seen allegedly attempting to pull a woman back from an angry protester. The media had reported that Soderberg was trying to rescue her, but according to several posts that he made to his Twitter account, the story that was ascribed to this encounter was also entirely fabricated. Naturally, since this was an altercation between two parties who were less than friendly with one another, both sides are disputing what actually occurred, and pointing the finger in the other direction. In addition to racist taunts from nearby sports fans, protesters were also attacked with vehicles while police looked the other way. Activist Michael Morstein spent most of the day at the protests and told The Free Thought Project that he witnessed a truck run over multiple protesters, with absolutely no response from police. 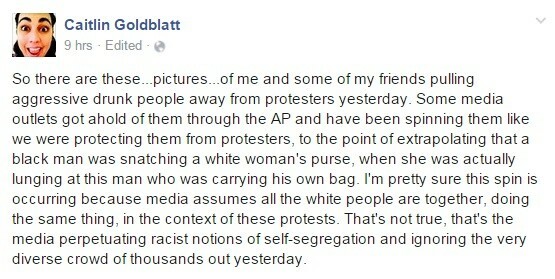 “I saw the truck run over the protesters, and the cops, like 40 of them didn’t even flinch, they just watched all of us. They didn’t even radio in to apprehend the driver who just ran over about 10 people,” he said. While it is likely that there rogue elements within the protest that failed to remain peaceful, we can see through these eyewitness accounts that there are many other sides to the story that are not being told. It is clear that the media is attempting to frame the issue in a way that creates more racial division and takes attention away from the issue of police brutality.